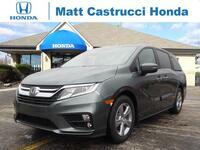 The 2016 Honda Odyssey in Dayton, Ohio offers some changes from the previous year. There are two new trims along with two variations available. The LX, EX, SE, EX-L, EX-L RES, EX-L Navi, Touring and Touring Elite offer a wider range of features, prices and options for drivers to choose from. This makes it easier for drivers to find a vehicle with the features that they want for a price that is more reasonable for them. Advanced features like the HondaVAC and rear entertainment DVD system are now more widely found in the Odyssey than they have been in years past before. A new feature found on the EX trim and above is the dual-screen audio display. The 8-inch and 7-inch screens work together to make it easier to use multiple functions at once. To go along with this audio display, the Odyssey comes standard with a 240 watt seven-speaker audio system and a rearview camera with guidelines. The Odyssey has continually been one of the safest minivans on the road over the years and thanks to features like Forward Collision Warning and Lane Departure Warning, the Odyssey gives you a second set of eyes on the road. They also provide visual and audio warnings so that even in moments of distraction it is easy to quickly realize that there may be a vehicle or other object in front of the minivan or that you have strayed from your lane. The engine is equally impressive. 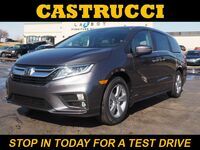 The 3.5-liter V6 is standard across all models of the Honda Odyssey and produces 248 horsepower and 250 pound-feet of torque, giving drivers the ability to 3,500 pounds while remaining highly efficient at 19 city/28 highway mpg*. Even with all these changes, the Odyssey only sees a slight increase in its base price at $30,155 when you include the destination charge. For more information on the 2016 Honda Odyssey and the trims available you can view the inventory online or contact the dealership by phone.